Saison, hopped with New World varieties, aged in Dolce noble rot wine barrels with brettanomyces. 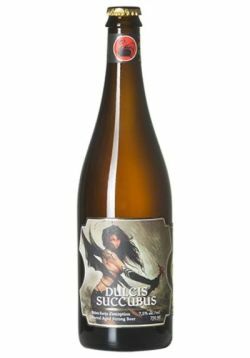 UPDATED: APR 2, 2019 Saison by Trou du Diable aged on barrels that previously contained botrytized (sweet) wine, 75 cl bottle from Geers near Ghent, shared with Goedele. Gusher, starting to rush out of the bottle about one second after opening - so you have a bit of time to anticipate it. Medium thick, egg-white, mousy, rather loose and large-bubbled, quickly breaking and opening but otherwise remaining head; initially lightly hazy 'old gold' robe with warm peachy hue and strong visible fizz, ever more misty and eventually clouded as the bottle nears its end. Aroma of sweet white grapes, golden raspberries, demi-sec white wine, ripe apricot, 'oaky' vanilla, melon, ripe pear, dry old wood, orange flesh, sawdust and dry earth notes. Fruity ponset, sweet with a tart edge, hinting at white grapes but also yellow plum, pear, peach and pineapple, some very light grape peel wryness even if it doesn't contain actual fruit, lively but 'refined' carbonation. Lean, smooth 'white-bready' malt sweetish body gently dried by increasing white wine tartness and clear tannic woodiness, with a lovely citrus flesh (rather than citrus peel) fraîcheur towards the end, probably the hops combined with this beer's natural, outspoken fruitiness. Ends with a long, spicy hop bitterness accentuated by this drying woodiness, but still the whole remains juicy and very fruity as well, with notes of white grape and yellow plum lingering. Not nearly as threatening as the label or name would suggest: this is a very elegant, crisp, bright and - I would almost say - 'happy' beer ideal for a sunny spring afternoon. Needs some time to open up its delicate features, but once it does, this is a lovely beer if you like your farmhouse ales mild, bright, quenching and fruity. UPDATED: MAR 20, 2019 Tap @ Cafe Sara. Unclear golden body with a small, lacing white head. Nice funky aroma with acidic berries, Brett, hint of dry cider and faint vanilla. Flavor is extremely refreshing, light pale malt, acidic berries, yellow citric fruit, some lemon and funky lambic. Balanced body and smooth refreshing aftertaste. Nice one. UPDATED: MAR 17, 2019 750ml bottle. Minimally cloudy, amber colour with small to average, frothy to creamy, half-way lasting, minimally lacing, off-white head. Mild, bretty, funky, fruity, oaky and vinous aroma, hints of red wine, cherry, red fruit. Taste is mellow malty, mildly tart, bretty and funky, oaky, vinous, fruity, hints of red wine, cherry, red fruit. Smooth, soft and silky palate, Very mild, superbly balanced - great! UPDATED: MAR 11, 2019 From tap at Bøker & Børst with JFE 11.03.19. Translucent pale straw colour. Bright white head and lacing. Acid aroma and taste, with brett, barnyard, tropical fruits and apricot. But mostly brett. Dry and astringent mouthfeel. Refreshing and complex. UPDATED: FEB 18, 2019 Sour apple flavors dominate, with a slight metallic taste in the background. Some flowery notes as well. Somewhat insipid. 750ml bottle thanks to Toby pours out golden topped with a fizzy white head. Nose is a mix of fruits berries stone and grapes. Taste is more of the nice fruit mix funky brett and barrel kick. bière couleur paille, effeverscente, moyennement troublée, sans col apparent mais laissant une légère dentelle à la surface. Au nez, arôme comlexe, houblonné, herbes sauvages, paille. Goût acidulé , herbes, paille, trop houblonné. J'en retire un certain agrément.